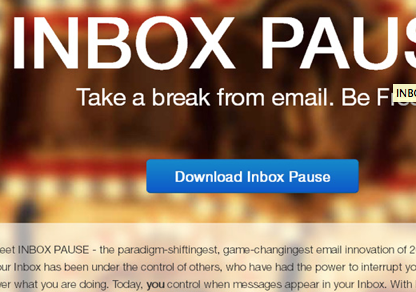 Meet INBOX PAUSE - the paradigm-shiftingest, game-changingest email innovation of 2012! For decades, your Inbox has been under the control of others, who have had the power to interrupt your flow and take over what you are doing. Today, you control when messages appear in your Inbox. With INBOX PAUSE, you can put new messages on hold, making it so they won't appear in your Inbox until you are ready for them. Paradigm shifted. Game changed.